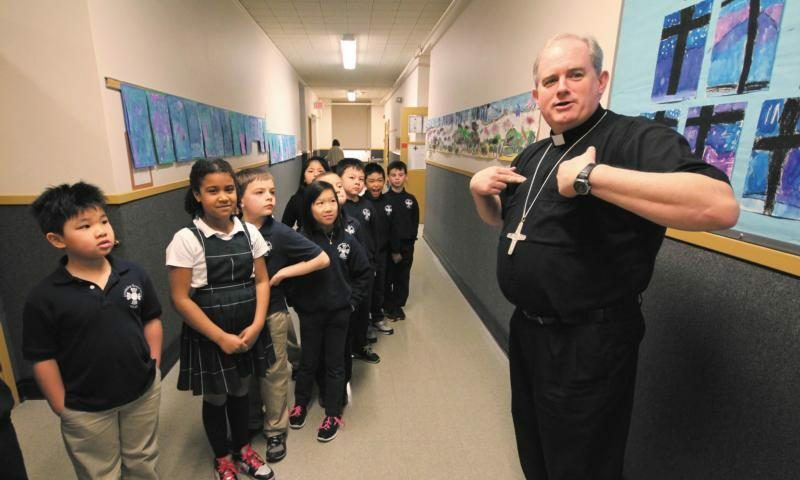 PORTLAND, Ore. (CNS) — It’s easy to forget that one of Oregon’s Catholic bishops is an immigrant. Portland Auxiliary Bishop Peter L. Smith, a native of South Africa, survived a laborious 13-year process to become a naturalized citizen of the United States. He thinks the nation should remember its vaunted entrepreneurial spirit comes from immigrants. He admits that few Oregonians think of him as foreign born because he is white and his speech patterns have become more American over the past 34 years. He feels compassion for immigrants who must manage larger racial, cultural and language differences; he sees them in Catholic parishes all over western Oregon. “Coming to another nation is not as simple as people think,” Bishop Smith says, comparing a culture change to having threads ripped out of a tapestry and replaced. He admires today’s immigrants, he says, because many are escaping danger or uprooting themselves and making sacrifices to help their children and future generations. “We need to harness the courageous spirit of immigrants,” he says. He came to the United States in 1983 on a temporary visa to visit the People of Praise, the charismatic Christian community to which he belongs. He quickly decided that he wanted to spend his life as part of the group, which is based in South Bend, Indiana. That began his long trek for permanent residency, or a green card. He took a trip home to see family in South Africa. A trained attorney, he knew he must have all his papers in order and did everything U.S. officials asked. But when he tried to get back into the United States, he and an Iranian man were pulled into interrogation rooms and forcefully questioned. He stood his ground, showing all he had done to comply. A supervisor decided to let him enter, but charged $15 for a visa extension, even though the future priest and bishop was not at fault. He had an urge to complain, but paid instead. Later, during the permanent residency application process, he was forbidden from leaving the United States. During that five years, three of his siblings were married. They mailed him pieces of wedding cake. His grandmother died. He was about to give up, but his spiritual director helped him see that the setbacks were small compared to the larger movement God had brought into his life. In 1990, he was approved for a green card. Shortly after, he moved from Indiana to Minnesota as a brother in the Brotherhood of the People of Praise. He discerned a priestly vocation, and in 1996 came to Oregon to join a People of Praise community here and begin studies at Mount Angel Seminary. In 1997, he was summoned to a federal immigration office in Portland for an interview because he had fulfilled the time span required to begin citizenship proceedings. He was worried about the conversation, since the Archdiocese of Portland and government officials were on opposite sides in matters such as assisted suicide and a tape-recorded jailhouse confession. The official noted the seminary on his record and he thought, “Oh-oh. Here we go.” But the woman smiled and said, “I think that’s wonderful.” It altered his feeling about immigration authorities. He later gathered with 150 people from all over the world, raised his hand and became a citizen. He was ordained a priest in 2001 and in 2014 was named an auxiliary bishop for Portland, which is headed by Archbishop Alexander K. Sample.